Triton has supplied a range of waterproofing systems, plus technical support, to a West London new build project comprising two adjoining, high spec mews properties. This was a compact site requiring a complex waterproofing design for a multi-level basement comprising lift pits and two swimming pools recessed into the lower basement level. 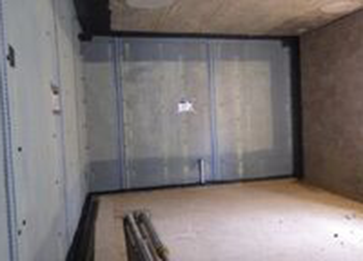 In view of the value of the properties and the variable water table, a combination of Types A, B and C waterproofing systems was specified to produce a robust solution, conforming to the Grade 3 basement category as defined in BS 8102:2009, that would inhibit any potential water ingress. Each property will benefit from a two storey basement, the lower basement in each housing a swimming pool, media room, gym and plant room. The basements were constructed using watertight concrete, with an external bentonite system installed as the first line of defence against moisture ingress, prior to the placement of the concrete. A continuous and linked internal waterproofing system was then installed using cavity drain membranes and liquid/cementitous applied materials. Cavity drain membranes were installed to all earth retaining perimeter walls and the lower basement slab. The system is designed to drain down from upper to lower level via discharge outlets from the bunded perimeter drainage channel at the upper level. At the lower level a recessed channel accommodates a continuous drainage conduit around the perimeter of both properties and is waterproofed with Triton’s liquid applied TT Vapour Membrane. Rodding eyes were installed at 10LM internals and at every change of direction to facilitate maintenance of the drainage system. The system drains to sumps in each property each fitted with Triton’s mains powered, twin Aqua Pump Pro system. The swimming pools, plant rooms, service trenches and lift pits are recessed into the lower basement level forming in effect a third basement level. Both pools and all walls at this level are waterproofed using Triton’s TT55, a cementitious liquid applied membrane combined with TTME elasticiser to accommodate changes in pressure caused by emptying and filling the pools and the noise and vibration from the lifts. A cavity drained system cannot be punctured so this system also facilitates the resin fixing of heavy plant to the walls in the plant rooms and service trenches. The perimeter drainage channel at floor level of the lower basement continues at the same level around the top of the swimming pool liner walls and discharges behind the walls of the trenches and plant rooms to either of the two sumps recessed in each plant room floor. Platon P20 membrane continues the sealed cavity drained system across the floors of the plant room and service trenches. The bunded upstands at floor wall junctions, and other wall/floor and wall/soffit details are sealed with Triton’s liquid applied TT Vapour Membrane and Corner Strip sealing material to create a complete and continuous internal waterproofing system across all substrates and levels of the basement.